Ambulances, doctors, staff, patients with mobility challenges and their families all need a safe thoroughfare into and out of your hospital or healthcare facility. Yet we understand that parking lots, the pavement in emergency drive-through areas and walkways are not always the first things on the mind of hospital and healthcare center administrators. And yet these very things often need regular maintenance to ensure they are safe and provide expeditious access to your buildings. Espina Paving is eager to help. We provide specialized asphalt maintenance for hospitals and healthcare centers so that you, your doctors, specialists and patients will never have to worry about getting where they need to go quickly and safely. Safe Accessibility—The last thing a patient in pain or an ambulance driver should ever have to think about is tripping over a pothole or uneven area when trying to get in to for important medical services. The pavement must be smooth, well-maintained, buckle and pothole free at all times. Espina Paving makes asphalt maintenance for hospitals and healthcare centers easy because we can automatically schedule services such as resurfacing, repairs, and sealcoats at times and in places that will not interfere with the important activities going on at the hospital or clinic. Meanwhile, we can make sure that these areas are always ready to receive their important traffic. Cost-Effective—We know that a lot of things are changing and revolving in the world of healthcare at the moment and that costs are a very big concern for all involved. Engaging Espina Paving’s asphalt maintenance for hospitals and healthcare can actually help, at least with this aspect of your budget. Neglected drives and parking lots cost more in the long run and you can get hit with extra insurance and legal costs if anyone ever suffers an injury or vehicle damage due to poorly maintained asphalt. We can help you keep up with a regular asphalt maintenance schedule to avoid these expenses with a minimum of effort and hassle for you or those you serve. A Healthier Environment—Doctors and patients alike are concerned with how the environment impacts health in so many ways. At Espina Paving, we are proud to say we recycle literally everything we use or take away during all of our asphalt maintenance for hospitals and healthcare projects. Furthermore, Espina Paving uses top notch environmentally-friendly paving technologies that can reduce the pollutants carried into our rivers and streams from runoff on our paving projects. 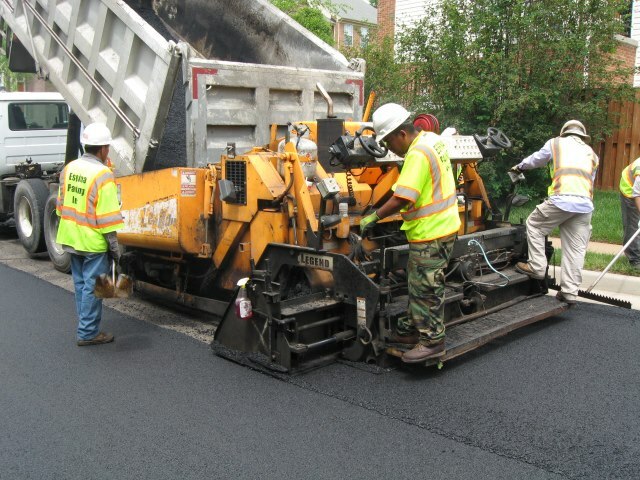 So if it is your job to make sure your hospital or healthcare center’s parking lots and paved areas are safe, smooth and up-to-the-job, just contact Espina Paving in Northern Virginia and we can make sure your patients, doctors, staff and visitors stay safe and never give a second thought to the paving: (703) 491-9100.